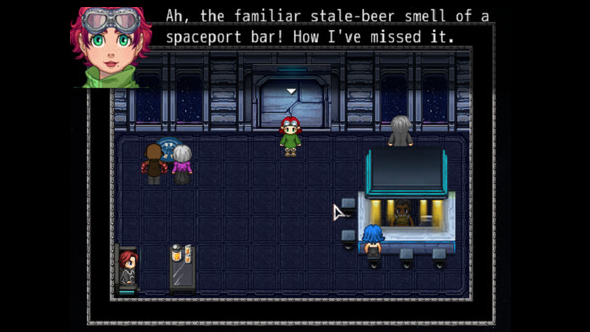 Win a Steam key for Space Pilgrim Episode I: Alpha Centauri, a classic point-and-click… but with interstellar travel. A fusion scientist, a retired space marine and a priest walk into a space bar. (Insert hilarious keyboard joke here.) They are all passengers on an interstellar voyage to Alpha Centauri on a ship captained by veteran pilot, Gail Pilgrim. Hazardous adventures are inevitable. Space Pilgrim Episode I: Alpha Centauri is a good old fashioned point-and-click adventure game, the first episode in a four part saga. Solve puzzles and step into a science fiction narrative written with humour and passion for the genre. Travel to space stations, colonies, cities and islands across the universe and meet a cast of interesting and unique characters. We’ve got 100 copies of this sci-fi adventure game to give away, and all you need to do for a chance to win is enter via our widget below. Each action is worth one entry, so the more you do, the higher your chance of winning. We’ll also need your email, but not for anything fishy – we just need a way to contact you should you win a key! If so, you’ll be given a code to redeem on Steam. Just click the ‘Add A Game’ button at the bottom of the Steam client window, and ‘Activate a Product on Steam’. Follow the instructions, download the game, and get playing! Want more giveaways? Like our Facebook page, or give our Twitter a follow, to be the first to hear about our latest competitions.